Peek-A-Book is an innovative system that inspires children to explore the library’s collection and take full advantage of its resources. 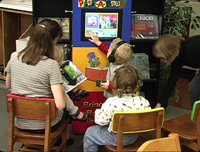 Dynamic audio-visual presentations highlight the content of books and reference materials, teach children where to find them, and empower them to acquire valuable learning skills. Eye-catching kiosks with an interactive touchscreen interface make learning about the library an exciting experience. Delightful puppet characters guide children through the system’s features. To see a demonstration, CLICK HERE. Subscribers have unlimited access to our ever-expanding content library. New book talks are added every month and are selected based upon quality and popularity with libraries nationwide. 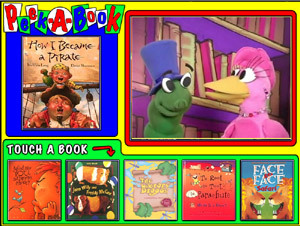 In addition, Peek-A-Book offers a variety of educational puppet shows, treasure hunts, and other presentations to help children learn about the library and its reference materials. CLICK HERE for the latest content selections. 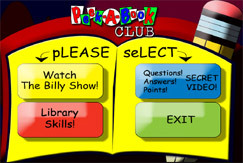 The Peek-A-Book Club is a special area where children can earn points for books they've read, master important library skills, and watch a fun educational puppet show. Click the image to the left to view screen shots. The number of visits to Peek-A-Book is automatically tracked by day, week and month, as well as the number of book presentations viewed and those that are most popular. Information is presented online in easy-to-view graphs and charts. Clients can program the content for their kiosks from our online content library. For details on how to purchase Peek-A-Book for your library, please call us toll free at 877-304-2424.